Most of us imagine robots as machines with a fixed form, engineered and programmed to perform a specific range of tasks. One might even say that in the future, there will be a robot for everything: delivering or carrying your stuff, checking you in at your hotel or flipping wheelies. But what if robots could also shapeshift, and adapt themselves to the needs of the moment? What if they were designed in a modular, adaptable way? In a paper published in Nature Communications, a team hailing from Lisbon, Brussels, and Switzerland describe how in order to test their concept, they used a group of Swarmanoids, a type of distributed robotic system consisting of small autonomous robots. These robotic swarming devices were developed back in 2011 under the direction of Dr. Marco Dorigo, one of the researchers who co-authored this paper. The idea that a robot can have a fluid form and ever-changing “nervous system” to suit any purpose is an intriguing one. 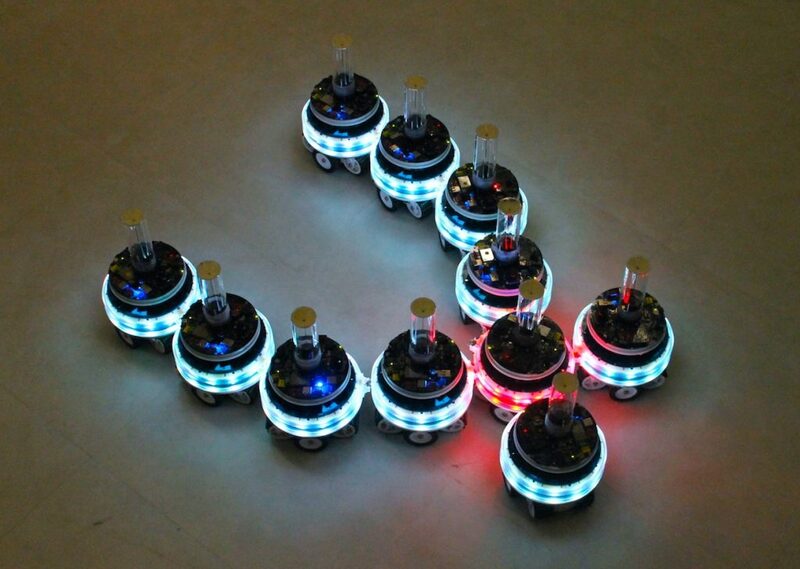 The team’s experiments show that a single MNS robot made up of any number of Swarmanoids can either divide itself up into several smaller groups or merge to form a larger unit. Each greater MNS whole will have one unit that acts as a brain, but if it splits up into two separate MNS robots, each will be able to adapt and designate a new “brain” module to oversee themselves. Conversely, if two of these modular robots join up, their respective control-center units are programmed to seamlessly cede control over to only one main unit within the new amalgamated body. This adaptation from one morphology to another happens almost instantly, thanks to the way the MNS robot is programmed, using a “recursive body representation” which takes the “physical connection topology” of a “rooted tree.” Thanks to this provision, regardless of size or shape, the team found that the MNS robots all consistently responded to an external stimulus — a green LED light — in the same manner during their tests, whether they were split up into smaller MNS robots or as one big MNS group. There are plenty of advantages to such a modular approach: such robots would need little time to adapt even as the physical form of the whole body shifts. These modular robots can acquire new functionalities when they merge; their ability to detect and respond to hardware problems through self-repair is a handy feature. As the researchers explain in an interview on IEEE Spectrum, as long as there are extra units in supply, the MNS robot would not fail due to malfunction, as its defective parts can be continually replaced. Modular, self-assembling robots such as these MNS robots have the potential to be used in a wide range of applications: from the nano-scale inside the human body, perhaps delivering therapeutic cargo to the organs; or perhaps as part of a space exploration mission, where these adaptable units might be deployed to navigate the treacherous terrain of the unknown to gather scientific samples or perform tests. In the bigger picture of things, one might ask too how these self-assembling modular robots might behave when swarm intelligence is added to the mix, and what might eventually emerge: perhaps an artificial species of intelligent, self-organizing robots? No one knows, but it’ll be something we can only imagine for the time being: the team is now working to refine their design further, hoping to develop robot swarms that self-assemble in three-dimensional space. Images: Université Libre de Bruxelles, Instituto Universitário de Lisboa, École polytechnique fédérale de Lausanne.